There is a serious amount of parsley in my garden at the moment. I always seem to have a feast or a famine with parsley, never just the right amount. The rampaging parsley made me look for a recipe, that wasn’t tabbouleh, that could use up lots of it. Not that I have anything against tabbouleh, I just wanted something different. 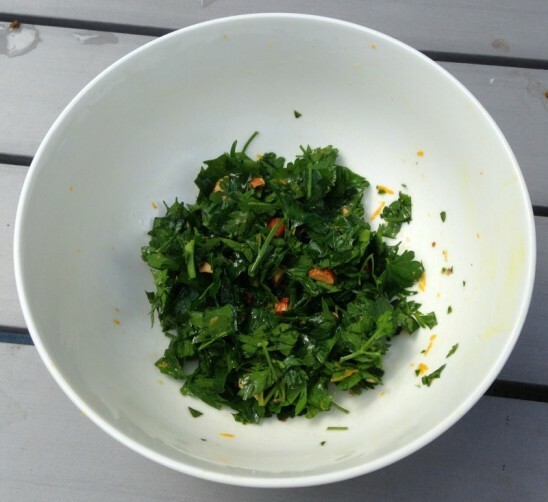 This is a salad that is perfect in winter/early spring when the parsley and oranges are at their best. The dressing could be applied to other vegetables such as shaved fennel. I’m eating it today with some sourdough and hummus. The salad started life as a recipe from Alton Brown but it now bears a tenuous relationship to the original. Wash and dry the parsley. Pick the leaves, chop coarsely and set aside. Discard the stems if they are a bit coarse or chop them finely. In a large bowl, whisk together the orange juice, zest, nut oil, sesame oil, and soy. Taste and adjust if needed. Add the parsley and almonds and toss to combine. Allow the salad to sit for at least 30 minutes before serving if you can. Could you use kale here instead of parsley? I don’t know if you can eat kale raw or not. Thanks! I’ve never eaten raw kale to be honest,but there are plenty of raw kale salad recipes out there so I guess so. I’d be inclined to chop it into ribbons to make it a bit more tender.